In the United Kingdom, medical industry has truly enormous amounts of documents which require translating on a daily basis. The sheer volume can be overwhelming and costly. Yet, accurate translations provided by an accredited translation agency are quite often nothing short of critical. When medical documents are translated and interpreted, accuracy of the translation is key. If medical documents are translated inaccurately, there is a greater potential risk of putting the patients at risk. Translating medical records and consulting patients who do not speak English to a good standard require the attention of professional linguists who have an additional, deep understanding of the medical terminology. It is imperative that translators understand medical terminology when assessing patient records. It is equally important that trained linguists are available to interpret the correct diagnosis for patients who do not speak English as their first language. The case of Willie Ramirez is a prime example of when a language miss-communication can be dangerous. The 18-year old was admitted to a South Florida hospital with food poisoning. His family could not speak English and used the word ‘intoxicado’ to explain their son’s condition to doctors. The patient was in a comatose state, and a member of the hospital staff who knew some Cuban Spanish interpreted ‘intoxicado’ as ‘intoxicated’. The patient was therefore treated for a drug overdose. However, as a result of the food poisoning, the young man was suffering from a brain haemorrhage. Because his condition was misdiagnosed he was not tested or treated properly and was subsequently left quadriplegic. The majority of conditions healthcare practitioners encounter are not urgent and therefore there should be enough time to accurately diagnose the condition, allowing the linguist the time needed to carefully and accurately translate the information into the patient’s native language. Not only is this important for doctors to understand the patient better, which then allows them to plan and implement a more suitable treatment, which considers all the information such as allergies or medical history, but also for explaining to non-English speaking patients how to treat their condition. It is important to note that immigrants living in the UK may not have the same source of medical care they do in their own country. Subsequently, there is an increased risk to patients who do not understand how to follow the instructions of prescribed medication or a specialised treatment plan. Occasionally, in the most unfortunate instances, an inaccurate interpretation of a medical condition can be a matter of life and death. In 2016, a nine-year old Vietnamese girl was taken to hospital with an infection. Her parents did not speak English very well and the physician diagnosed the girl’s condition as gastroenteritis. The treatment prescribed by the doctor was inappropriate. Furthermore, because the hospital failed to provide an interpreter, the parents did not understand that the medication could have side-effects. Subsequently, the girl suffered a severe allergic reaction. Because the parents were unaware of the warning signs, they did not seek immediate medical assistance. As a result, the young patient tragically died. An expert witness in the resulting malpractice case confirmed the child would probably have survived had the hospital provided a professional medical interpreter. Why hire a professional medical interpreter? A study performed in the United States showed that trained interpreters make fewer mistakes. Over the course of seven months, researchers in the pediatrics department of Boston Medical Center assessed encounters between physicians and non-English-speaking patients and their interpreters. Half the interpreters were trained as professional linguists. The other half were ad-hoc interpreters who were on-hand around the hospital such as healthcare practitioners, family members and social workers. The results of the study revealed that an average of 31 interpretation mistakes occurred per consultancy. The researchers concluded that professionally trained medical interpreters are a lot less likely to make mistakes and are essential to health care facilities. In the UK, the NHS is working on a policy that will entitle patients the right to be given access to a professional interpreter. At the time of writing the option is available, but most health practitioners ignore the policy. A NHS focus group is currently working on a system that will improve the quality of healthcare by providing non-English speaking and deaf patients access to professional interpreters. Immigrants who are seeking medical attention in the UK face enormous challenges. People from foreign-born backgrounds encounter unique barriers when receiving healthcare. There is not only the issue of language, but also the disparate health practice beliefs and a lack of cultural awareness on the part of medical practitioners. Cultural sensitivity is a crucial component of medical interpreters. When treating foreign patients, healthcare providers need to consider the cultural values of the patient in relation to treatment, their view of the body and its functions and the type of treatments they are accustomed to. In some parts of the world, traditional medical practices are more common than western medicine. Treatments we perceive as ‘alternative’ are routine practices in Asia, Africa and the Middle-East. Spiritual needs are also addressed as medicinal treatments in these cultures. Hospitals also face the challenge of staying compliant with privacy laws. Whilst protecting personal information of patients is paramount, critical health-related documents that require translation must be secured in the hospital’s network. On the other hand, medical facilities have a professional and ethical obligation to provide adequate health care to all their patients. Adequate care involves ensuring that communication between patients and medical staff is clear and understood. As we showcased in the examples above, misinterpretations can lead to misdiagnosis and incorrect treatments. You can read about other consequences of mishaps that can occur when translations go wrong in a previous article. In most instances, medical errors can be avoided. The biggest challenge for healthcare practitioners attending to foreign patients is the Emergency Department. Understanding what medications a patient is taking or when they last ate can make a difference in administering the correct treatment. The healthcare industry needs to translate high volumes of documentation on a daily basis. When trained medical translators are not commissioned, common errors can occur and continue to reoccur. One of the most frequent errors is abbreviations. Regardless of language, there are several abbreviations that are used for different words. An analytical study of medical errors identified between 1500 and 30,000 medical abbreviations were confusing. And that was just in English. Other language pitfalls include neologisms, synonyms and the evolution of language. The ubiquitous use of newly coined words mixing with terms that are being replaced makes it difficult to update and correct medical records, referencing dictionaries and specialised glossaries that lead to translation problems. Incorrectly translated instruction manuals can also lead to medical disasters. In 2007, 47 patients in Germany were given faulty knee transplants because the instructions had not been translated properly. Several patients suffered great pain and the hospital in Berlin had to perform remedial surgery. The most common source of translation error however, comes from within the medical profession. Far too often, doctors trust the opinion of medial staff that can speak a second language, but are not trained professionals. There is a significant difference. Healthcare facilities would also run into problems if they were to consult an interpreter that was not trained in medicine. The medical field is a specialist niche with a language of its own and requires a professional translator with an understanding of conditions and treatments to provide an accurate interpretation. A study published in the Annals of Emergency Medicine, outlines the importance for healthcare facilities to provide adequate translation and interpretation services. Researchers examined 57 interactions in the emergency room of a working hospital and discovered 1884 errors were made due to inadequate translation or interpretation. Furthermore, 18% of the incidents were deemed as having potentially damaging consequences. When professionally trained interpreters with less than 100 hours of training were presented with the same scenarios, the percentage of errors dropped to 12%. For trained professionals with over 100 hours of training, the number of errors dipped to just two per cent. 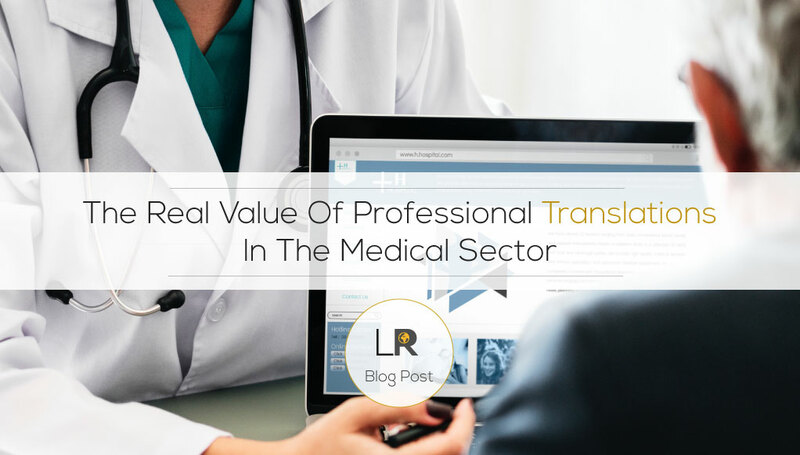 When you consider the results of this study, it is clear to see how an experienced medical translator can benefit the medical industry – particularly in emergency situations. Not only does this improve the quality of healthcare patients receive, but dramatically reduces the risk of medical malpractice. Communication is key in any industry, but more so in the medical profession that any other. There literally is potential for life and death. Although medical facilities are reluctant to use professional medical interpreters due to the perceived cost, eliminating translation errors offers patients and the healthcare profession real value.